Although we holdout for God’s justice to prevail in the end, the grief we feel at the injustices in the world can easily overwhelm us. Upon first hearing about the slaughter of the 20 first grade children at Sandy Hook Elementary school a couple weeks ago, my heart grew sick and blocked it from my mind and refused to watch the news and face the reality of the whole evil mess! But now this tragedy has aligned itself with all the atrocities man has perpetrated on man. It’s another slaughter of the innocents as Herod did in Bethlehem. Every trip we’ve taken to Israel has ended at Yad Vashem. It’s the name of the Holocaust Museum in Jerusalem. 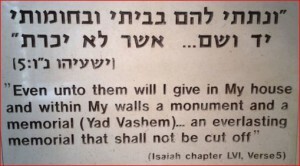 It means “a place and a name.” It’s taken from the book of Isaiah, chapter 56, and verse 5, where God promises that within the walls of Israel there will be a memorial for the innocent who suffered at the hands of evil. It’s to be an “everlasting memorial” and represents the vindication of the righteous. 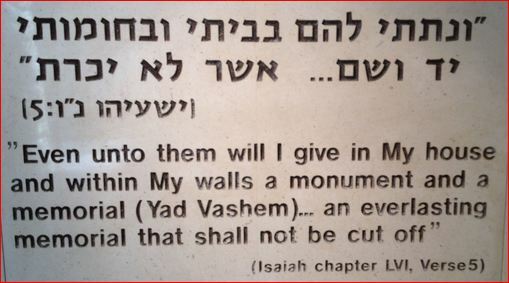 The passage says, “I will give in my house and within my walls a monument and a name…I will give them an everlasting name that shall not be cut off.” A walk through the museum is the most sobering experience one might ever encounter in life. It contains the largest collection of documented footage and still images of the most extreme atrocities of man upon man. Some on our tours would wait at the coffee shop or browse the stores in the four quarters of Jerusalem rather than visit the museum. It’s nearly impossible to witness such wickedness and not be deeply moved by it. The Orthodox Jew in Israel sees the museum as the place at which every name of those slaughtered in the holocaust will be recorded forever and the generations that follow will pay their respects. It’s their eternal monument or memorial to and for the slaughtered innocent. But Jesus took this idea of a “place and a name” and gave it to all who would come to faith in Him (the slaughtered innocent Son of God). There is a place where our names are memorialized as well. When His disciples returned from their missionary trip they were thrilled and excited about the fact that they had power over “evil” spirits. Jesus said to them, “Nevertheless do not rejoice in this, that the spirits are subject to you, but rejoice that your names are recorded in heaven” (Luke 10:20). There is “a name and a place” for every victim in this sin cursed world. The name is written in the book of life and the place is a place Jesus referred to as heaven. It’s not an earthly resident, but a spiritual one that will last forever in which all evil will be eradicated and every tear will be wiped away and joy will reign in every life.